Brutal Legend is what happens when you mix rock, art and game together. The story is about the world's greatest roaddie Eddie Riggs being thrown back in time to the ancient age of rock. He mas master the power of rock to stop evil. What a riot. Reminds me of a certain other Hollywood film. The Art of Brutal Legend is probably the largest art book printed by Udon so far. It's a huge hardcover measuring about 12 by 12 inches. There are 252 pages. I like that the page numbers are marked out like the time you see on music players. Nice touch. I remember the book was scheduled for release a few years ago, but it never came out until recently after Udon published it. 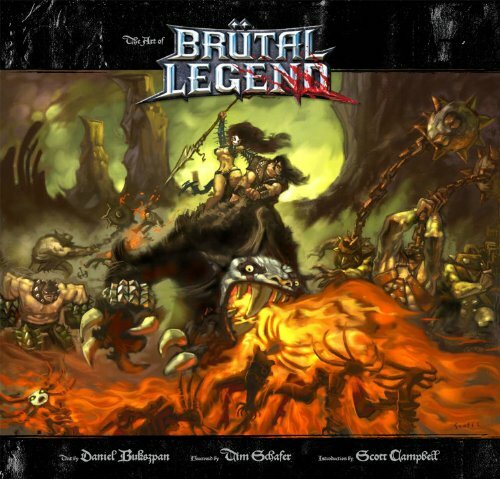 The Brutal Legend game came out in 2009. The book features concept art for the weird, interesting characters and macabre landscapes. The art style looks like they are drawn by a rock-dreaming teenager who's about to get detention for the drawings, or a rocker who knows how to draw. The enemies look pretty cool. You've the cliche dudes with studded leather jackets, tattoo brutes, then you have flying microphones, rockers who smoke through exhaust pipes, organ pipe car and other interesting combinations of concepts. The text covers the character profiles, design ideas and background to creating the game. You can read all about the different legends and mythologies created for the game. This is a fine video game companion art book. By the way, the game's created by Double Fine Productions. Recommended to fans of the game.